Why the graphic tablet ? A major component of the Cantor Digitalis is its interface. Several criteria are considered for the selection of the control interface. First, as a reactive musical instrument, the latency must be less than the perception threshold, as control gestures are planned and not only selection gestures. The time resolution of the Wacom Intuos 5M tablets is 5 ms with a pen and 20 ms with a finger, and the USB time transmission of the data to the computer is negligible. Here are the conditions to get the illusion that the sound and the gesture are related by a direct causality, like in an acoustical instrument. Second, the interface must perform a high spatial resolution to allow the continuity of the control gesture to avoid hearing the quantification steps. Wacom Intuos 5M tablets have a spatial resolution of 5080 lines per inch (0.005 mm) and 2048 levels of pressure, which is far higher than what a graphic tablet pen can reach (limited by the diameter of the pen tip and the small amplitude of the pen tip spring). Lastly, a synthetic sound is all the more realistic than its parameters are not static. Hence the interface must allow a precise, repeatable, intuitive and constantly dynamic gesture. 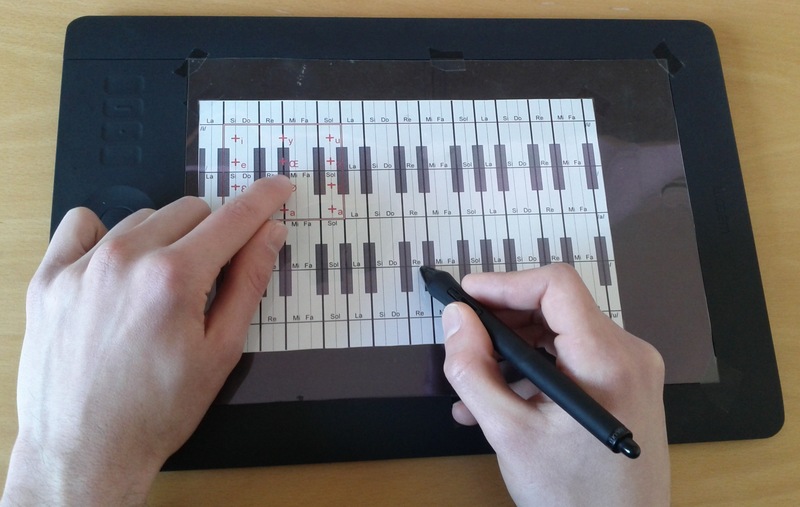 The pen tablet, initially designed for computer drawing, meets these criteria by using a gesture known by all and practiced since the childhood. Compared to mouse or trackpad, the tablet offers the possibility of playing subtle modulations of parameters, essential for the sound quality. The touch technology takes advantage of a new but spreader and spreader use of fingers on phones and computer tablets. Nevertheless, to get an overview of the system without possessing a graphic tablet, the software proposes a control with mouse and keyboard. Cantor Digitalis is a performative parametric voice synthesizer. It implements the linear acoustic source-filter model of voice production. The "filter" or "vocal tract" part of the system is computed using a parallel structure made of digital second-order resonators. Vowels are controlled according to synthesis rules. The "source" or "glottal flow derivative" part of the system is computed using a linear model. The parameters are combined for controlling six vocal dimensions: pitch, voice tension, breathiness, roughness, laryngeal mechanisms, and vocal effort. CantorDigitalis includes presets for voice categories (baritone, tenor, alto, soprano), voice range profiles, source-filter interactions (formant and harmonic tuning), high F0 resolution, vocal tract size, vocalic space and voice quality control. EURASIP Journal on Audio, Speech and Music Processing, in edition. Margaret Guthman musical instrument competition, Atlanta, GA, USA, February 19-20, 2015. Journées d'informatique musicale, Bourges, France, May 23, 2014.